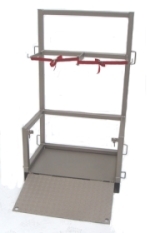 See Lift Safe Directs new range of cylinder lifting cages. 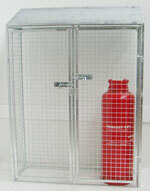 These cages are ideal for construction sites or site work was safe cylinder movement and storage is a constant problem. 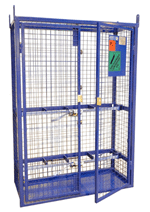 The standard cages are designed to carry up to eight full sized cylinders and include a free single cylinder trolley. We also offer an in-house design service. So if you cannot see a product to meet your requirements please contact our sales and design staff, we are sure we can help. This cylinder-lifting cage is designed for using with a forklift truck, the cage will hold a combination of either six large Propane or eight large Oxygen/Acetylene cylinders. 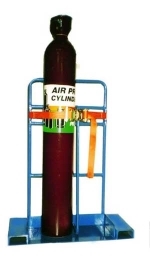 This cylinder lifting cage as been designed for use with an overhead crane and will hold a combination of either six large Propane or eight large Oxygen/Acetylene cylinders. This cylinder lifting cage as been designed for use with a overhead crane and will hold a two large oxygen and two large acetylene cylinders. 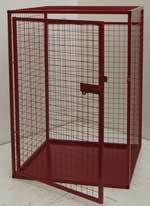 The cage is constructed from fully welded strongbox section and 10g mesh infill with lockable double doors and has a checker plate floor. The cylinders are secured with locking straps. Complete with attached SWL plate and mill test certificate. 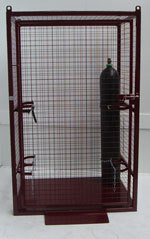 Fully enclosed cylinder cage for the storage of 4 x 47kg propane/butane cylinders. Constructed from fully welded box section with 10g mesh infill, with lockable door and rear hose and gauge access points, wall and floor fixing points and is finished in a durable polymer powder coated finish. Fully enclosed cylinder cage for the storage of 4 x full size cylinders choose cylinder size from options. Constructed from fully welded box section with 10g mesh in fills. With lockable door and wall and floor fixing points. And is finished in a durable polymer powder coated finish. 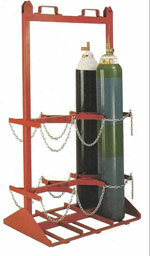 Free standing cylinder-lifting stand to hold 4 large oxy/acetylene cylinders (230 mm to 286 mm Dia cylinders), or to hold 4 large oxy/propane cylinders (230mm and 375mm Dia cylinders). Free standing cylinder-lifting stand to hold 6 large oxy/propane cylinders (230mm and 375mm Dia cylinders) or to hold 6 large oxy/acetylene cylinders (230 mm to 286 mm Dia cylinders). 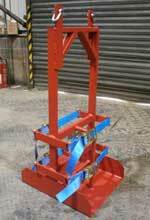 4 cylinder lifting stand to suit 2 oxy and 2 acetylene flame pak cylinders. Free standing cylinder-lifting stand to hold one cylinder, we will manufacture this cylinder lifter to hold any diameter cylinder from 230 mm to 375 mm. Cylinder Lifter, Holder and Transport Platform. A very robust twin cylinder-lifting platform constructed from fully welded strongbox section with a hinged lockable ramp. Can be used with a standard pallet truck or forklift truck. The cylinders are secured with two 1 tonne rated quick release cam buckle straps. Fitted with transport securing points. Cylinder pallet designed to lift a large pair of oxy/acetylene cylinders with the aid of a forklift truck. The cylinders are held in position by a ratchet strap. Certified to one tonne capacity..